On April 29, the Partech Shaker hosted the first “Morning Meetings” – or Matinales – of Dropbox France. Dropbox had just celebrated its office opening anniversary. The event was a great opportunity for participants to meet the team, learn about the collaborative platform and get a clearer vision of the roadmap. Not only does Dropbox aim at sharing files, but also at simplifying the way we work together and, hence, helping users create value. This is what Dropbox calls “Creative Freedom”: solutions for more efficiency, flexibility, and simplicity. 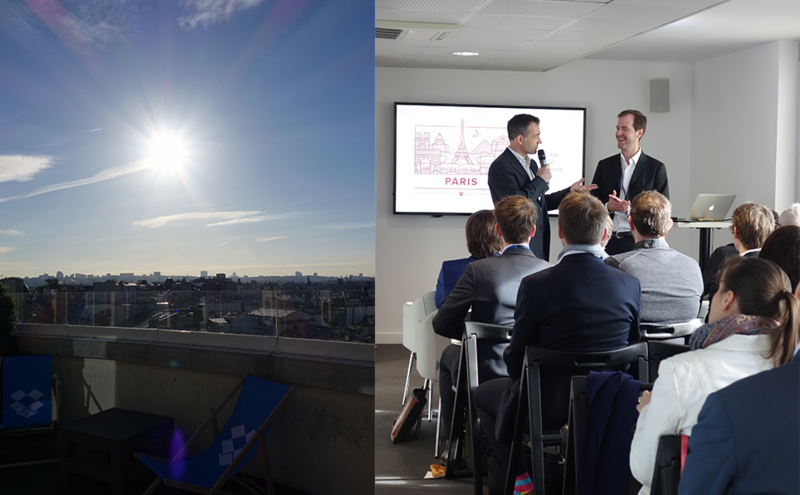 Philippe Plichon, Dropbox Country Manager for France, after a hearty welcome on the rooftop of the Partech Shaker, detailed the dramatic increase in Dropbox users the 1st year in France: among the 500 million global users, 15 million are French. Dropbox double technology of encryption (transit and storage) and integration in third-part security technologies and API are key to their success. It is also important for Dropbox to let European customers choose where they wish to localize their data; that’s why they announced that they are planning to deploy infrastructure in Germany in Q3. These guaranties and new features for businesses, such as synchronization 5 times more rapid than competitors’ solutions, are convincing more and more IT managers to choose Dropbox. Rob Baesman, Head of Product, for Dropbox Pro, Business & Enterprise, presented Dropbox Paper and Project Infinite. Dropbox Paper is a centralized workspace that lets users bring together ideas, documents, medias and even code, while Project Infinite gathers infinite capacities of the cloud with reduced capacities of terminals. No need to synchronize anymore and store on your computer. The solution works on Mac, and Windows, 10, 8 and 7. This Morning Meeting was essentially the celebration of Dropbox’s first year in France. Several strategic clients have been invited to testify their use of Dropbox, like Lagardère Active, BlaBlaCar, and Castor & Pollux. Dropbox was happy to thank them, as well as international distributors resellers such as Ingram Micro, and all partners who trust them in France. The Dropbox team is already thinking of organizing the next Morning Meeting to share new innovations and developments. In the meanwhile, Join the MindShaking Lunch MeetUp group and don't miss any of our next events!